Joe Richards and Jérôme Devémy have provided some photographs of locations associated with Georges Simenon, and here is some additional information to go with certain items. "Au Pont des Arches" was the first novel that Simenon wrote. This was in 1920 when he was working for the daily newspaper the Gazette de Liége and aged seventeen. The sub-title of the novel is "Petit roman humoristique de murs liégoises" (A short humorous novel of Liégeois ways of life) and its main gist is a proposed money-making scheme for the mass-production of purgative pills for pigeons! The main title reflects the name of the bridge Le Pont des Arches which spans the river Meuse between the Rue Léopold (where Simenon was born) and the district of Outremeuse. At the time of writing this novel there was a clothes shop at 48 Rue Léopold that was called Au Pont des Arches. 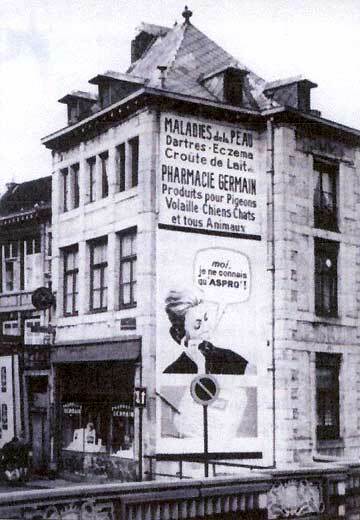 He based the main location of the novel on a real chemist shop, the Pharmacie Germain at 13 Rue-du-Pont-des-Arches, a short side street that can still be found on the left where the Rue Léopold joins the bridge. Unfortunately this shop was demolished in the early 1970s and at present (September/October 2003) it is an active building site. Simenon found a printer who would print his novel providing the author could guarantee to sell three hundred copies by subscription. This was achieved and in 1921 the printer, Imprimerie Bénard, ran off fifteen hundred copies under the author's pseudonym of Georges Sim. This paperback book measures 21 � 14 centimetres, has 96 pages and is illustrated with black and white drawings by four of Simenon's friends, Luc Lafnet (who also illustrated the cover), Jeph Lambert, Ernest Forgeur and Joseph Coulon. All were part of the group of former students who called themselves La Caque (In the Maigret novel Le Pendu de Saint-Pholien  The Crime of Inspector Maigret / Maigret and the Hundred Gibbets  Simenon has a similar group who call themselves Les Compagnons de l'Apocalypse  The Companions of the Apocalypse). The novel "Au Pont des Arches" has not been translated into English, but the French text has been reprinted. One of the most useful reprints is by the publishers Presses de la Cité, 1991 (ISBN 2-258-03401-9), a paperback, which also includes two other works that Simenon wrote soon after, the novel "Jehan Pinaguet" and an essay "Les Ridicules" in which he pokes fun at some of his friends and himself. 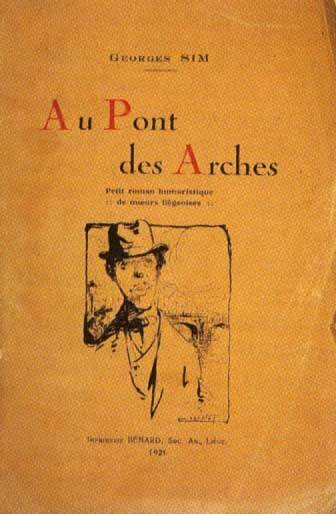 The cover of the first edition of "Au Pont des Arches", 1921. Unfortunately there is an error of identification with one of Jérôme's photographs. 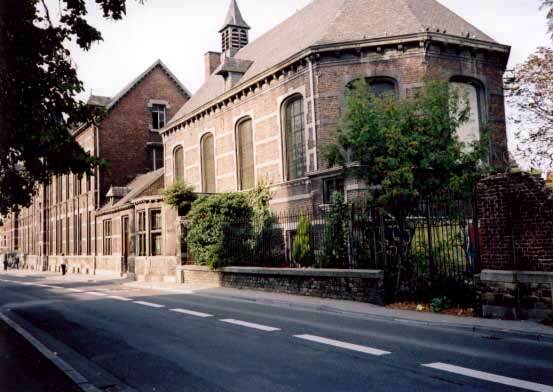 The building that was labelled Saint-Nicholas Church [now corrected] is in fact the Chapel of the Bavière Hospital which is dedicated to Saint Augustine and is located along the Rue des Bonnes Villes. The Church of Saint Nicholas (Joe's photograph number 14) is to be found in the Rue Fosse-aux-Raines that runs from the Place de l'Yser to the Rue Jean-d'Outremeuse. The Simenon family as a whole, grandparents, parents, uncles and aunts, as well as young Georges attended this church. 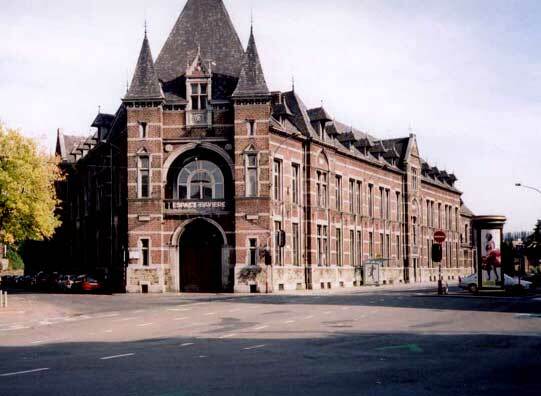 A different photographic view of the Bavière Hospital showing its extent along the Rue des Bonnes Villes. The Chapel is at the far end. A photograph of the Chapel looking back along the Hospital building. Simenon knew this establishment as a boy and in December 1970 his mother, who had died in this hospital aged 90, received her funeral service in this chapel. When I was photographing the façade of this house, I became aware that someone was looking out of the right-hand window on the second floor where the author was born. In fact it is Simenon himself  that is a life size photographic cutout that probably will be there whilst the commemorations last. This "appearance" can be seen in Joe's photograph number 9: a view of the entire house.